This article is about a chemical compound. Ethane is a chemical compound with the chemical formula C2H6. It is classified as an alkane, that is, an aliphatic hydrocarbon. It is the only two-carbon alkane. At standard temperature and pressure, ethane is a colorless, odorless, flammable gas. It is isolated on an industrial scale from natural gas and as a by-product of petroleum refining. The chief use of ethane is as a petrochemical feedstock for ethylene production on a commercial scale. It is also being investigated as a potential feedstock for other commodity chemicals. In addition, it can function as a refrigerant in cryogenic refrigeration systems. In scientific research, liquid ethane is used to rapidly freeze water-rich samples for electron microscopy. Ethane was first prepared synthetically in 1834, by Michael Faraday, applying electrolysis of a potassium acetate solution. He mistook the hydrocarbon product of this reaction for methane and did not investigate it further. During the period 1847–1849, in an effort to vindicate the radical theory of organic chemistry, Hermann Kolbe and Edward Frankland produced ethane by the reductions of propionitrile (ethyl cyanide) and ethyl iodide with potassium metal, and (as did Faraday) by the electrolysis of aqueous acetates. They, however, mistook the product of these reactions for methyl radical, rather than the dimer of methyl, ethane. This error was corrected in 1864 by Carl Schorlemmer, who showed that the product of all these reactions was ethane. The name ethane was derived from the term ether, which initially referred to diethyl ether. Because halogenated forms of ethane can undergo further free radical halogenation, this process results in a mixture of several halogenated products. In the chemical industry, more selective chemical reactions are used for the production of any particular two-carbon halocarbon. The principal carbon-containing products of incomplete ethane combustion are single-carbon compounds such as carbon monoxide and formaldehyde. One important route by which the carbon-carbon bond in ethane is broken to yield these single-carbon products is the decomposition of the ethoxy radical into a methyl radical and formaldehyde, which can in turn undergo further oxidation. Similar reactions (although with species other than oxygen as the hydrogen abstractor) are involved in the production of ethylene from ethane in steam cracking. Another method, the oxidation of acetic anhydride by peroxides, is conceptually similar. After methane, ethane is the second-largest component of natural gas. Natural gas from different gas fields varies in ethane content from less than 1 percent to over 6 percent by volume. Prior to the 1960s, ethane and larger molecules were typically not separated from the methane component of natural gas, but simply burnt along with the methane as a fuel. Today, however, ethane is an important petrochemical feedstock, and it is separated from the other components of natural gas in most well-developed gas fields. Ethane can also be separated from petroleum gas, a mixture of gaseous hydrocarbons that arises as a byproduct of petroleum refining. Economics of building and running processing plants can change, however. If the relative value of sending the unprocessed natural gas to a consumer exceeds the value of extracting ethane, then the plant may not be run. This can cause operational issues managing the changing quality of the gas in downstream systems. Ethane is most efficiently separated from methane by liquefying it at cryogenic temperatures. Various refrigeration strategies exist: The most economical process presently in wide use employs turboexpansion, and can recover over 90 percent of the ethane in natural gas. In this process, chilled gas expands through a turbine, and as it expands, its temperature drops to about -100 °C. At this low temperature, gaseous methane can be separated from the liquefied ethane and heavier hydrocarbons by distillation. Further distillation then separates ethane from the propane and heavier hydrocarbons. The chief use of ethane is in the industrial production of ethylene by steam cracking. When diluted with steam and briefly heated to very high temperatures (900 °C or more), heavy hydrocarbons break down into lighter hydrocarbons, and saturated hydrocarbons become unsaturated. Ethane is favored for ethylene production because the steam cracking of ethane is fairly selective for ethylene, whereas the steam cracking of heavier hydrocarbons yields a product mixture poorer in ethylene, and richer in heavier olefins such as propylene and butadiene, and in aromatic hydrocarbons. Experimentally, ethane is being investigated as a feedstock for other commodity chemicals. Oxidative chlorination of ethane has long appeared to be a potentially more economical route to vinyl chloride than ethylene chlorination. Many processes for carrying out this reaction have been patented, but poor selectivity for vinyl chloride and corrosive reaction conditions (specifically, a hydrochloric acid-containing reaction mixture at temperatures greater than 500 °C) have discouraged the commercialization of most of them. Presently, INEOS operates an ethane-to-vinyl chloride pilot plant at Wilhelmshaven in Germany. Similarly, the Saudi Arabian firm SABIC has announced construction of a plant to produce acetic acid by ethane oxidation at Yanbu. The economic viability of this process may rely on the low cost of ethane near Saudi oil fields, and it may not be competitive with methanol carbonylation elsewhere in the world. Ethane functions as a refrigerant in cryogenic refrigeration systems. On a smaller scale, in scientific research, liquid ethane is used to vitrify water-rich samples for electron microscopy. A thin film of water, quickly immersed in liquid ethane at -150 °C or colder, freezes too quickly for water to crystallize. This rapid freezing does not disrupt the structure of soft objects present in the liquid state, as the formation of ice crystals can do. At room temperature, ethane is a flammable gas. When mixed with air at 3.0-12.5 percent by volume, it forms an explosive mixture. Some additional precautions are necessary where ethane is stored as a cryogenic liquid. Direct contact with liquid ethane can result in severe frostbite. In addition, the vapors evaporating from liquid ethane are, until they warm to room temperature, heavier than air and can creep along the ground or gather in low places, and if they encounter an ignition source, can flash back to the body of ethane from which they evaporated. Containers recently emptied of ethane may contain insufficient oxygen to support life. Beyond this asphyxiation hazard, ethane poses no known acute or chronic toxicological risk. It is not known or suspected to be a carcinogen. A photograph of the northern latitudes of Saturn's moon Titan. 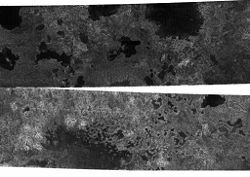 The dark features appear to be hydrocarbon lakes, but further images will be needed to see if the dark spots remain the same (as they would if they were lakes). Ethane occurs as a trace gas in the Earth's atmosphere, at a current concentration at sea level of around 0.5 parts per billion by volume (ppbv), although its pre-industrial concentration is likely to have been substantially lower, because a large proportion of ethane in today's atmosphere is thought to have originated from unburned fossil fuels. Although ethane is a greenhouse gas, it is much less abundant than methane and also less efficient relative to mass. It has also been detected as a trace component in the atmospheres of all four giant planets, and in the atmosphere of Saturn's moon Titan. In the case of Titan, it was once widely hypothesized that ethane produced in this fashion rained back onto the moon's surface, and over time had accumulated into hydrocarbon seas or oceans covering much of the moon's surface. Infrared telescopic observations cast significant doubt on this hypothesis, and the Huygens probe, which landed on Titan in 2005, failed to observe any surface liquids, although it did photograph features that could be presently dry drainage channels. In December 2007, the Cassini probe found at least one lake at Titan's south pole, now called Ontario Lacus because the lake's area is similar to that of Lake Ontario on Earth (approximately 20,000 km²). Further analysis of infrared spectroscopic data presented in July 2008 provided stronger evidence for the presence of liquid ethane in Ontario Lacus. In 1996, ethane was detected in Comet Hyakutake, and it has since been detected in some other comets as well. The existence of ethane in these distant Solar System bodies may implicate ethane as a primordial component of the solar nebula from which the Sun and planets are believed to have been formed. ↑ Michael Faraday, Experimental researches in electricity: Seventh series, Philosophical Transactions 124:77–122. ↑ Hermann Kolbe and Edward Frankland, On the products of the action of potassium on cyanide of ethyl, Journal of the Chemical Society 1:60–74. ↑ Edward Frankland, On the isolation of the organic radicals, Journal of the Chemical Society 2:263–296. ↑ Carl Schorlemmer, Annalen der Chimie (1864) 132:234. ↑ Hermann Kolbe, Researches on the electrolysis of organic compounds, Journal of the Chemical Society 2:157–184. ↑ www.atmosphere.mpg.de, Lower Atmosphere: Distribution and Concentration (2). Retrieved September 21, 2008. ↑ NASA, NASA Confirms Liquid Lake on Saturn Moon, Jet Propulsion Laboratory. Retrieved September 21, 2008. ↑ R.H. Brown et al., The identification of liquid ethane in Titan's Ontario Lacus, Nature. 454:607-610. Retrieved September 21, 2008. ↑ Michael J. Mumma et al., Detection of Abundant Ethane and Methane, Along with Carbon Monoxide and Water, in Comet C/1996 B2 Hyakutake: Evidence for Interstellar Origin, Science 272(1996): 1310–1314. McMurry, John. 2004. Organic Chemistry, 6th edition. Belmont, CA: Brooks/Cole. ISBN 0534420052. Morrison, Robert T., and Robert N. Boyd. 1992. Organic Chemistry, 6th edition. Englewood Cliffs, NJ: Prentice Hall. ISBN 0136436692. Olah, George A., and Árpád Molnár. 2003. Hydrocarbon Chemistry. Hoboken, NJ: Wiley-Interscience. ISBN 978-0471417828. Solomons, T.W. Graham, and Craig B. Fryhle. 2004. Organic Chemistry, 8th edition. Hoboken, NJ: John Wiley. ISBN 0471417998. Yaws, Carl L. 2005. The Yaws Handbook of Physical Properties for Hydrocarbons and Chemicals: Physical Properties for More Than 41,000 Organic and Inorganic Chemical Compounds: Coverage for C1 to C100 Organics and Ac to Zr Inorganics. Houston: Gulf Pub. Co. ISBN 978-0976511373. This page was last modified on 15 August 2017, at 15:27.